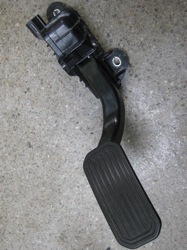 Curious about the Prius accelerator pedal? Toyota will be recalling all from the “Gen 2s”, model years 2004-2009, along with a few million others. It’s worth noting that the original crash that spawned this safety campaign involved a non-hybrid Lexus with push-button start. The Prius is included in the previous floor mat “safety campaign”, yes, as well as the one recently announced for accelerator pedals, but the car has also become an icon of Toyota innovation, not to mention the blurring line between computer and automobile. If there is any car suspected of being too complex, too radical, or at least highly watched for any signs of failure, I believe it is the Prius. According to my local dealer, there is no accelerator replacement currently available for the Prius. The updates will no doubt have a different pedal shape, to aid avoidance of creeping floor mats. An interim fix may be simply cutting a portion of the current pedal away. 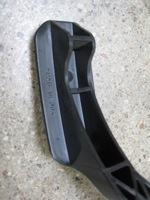 The pedal lever is one solid plastic piece, which could be easily modified by a hot knife along some Toyota-issued template. This is wholly speculation on my part; what they will actually end up doing remains to be seen. The good news is that the pedal is super simple to remove: two 10mm bolts accessible under the dash and one connector, so recall effort should be minimal. I pulled this unit out in 5 minutes. 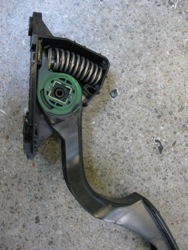 The mechanism includes a large spring assembly to provide the “kinaesthesia” of a traditional accelerator pedal (that actually connects to an engine). 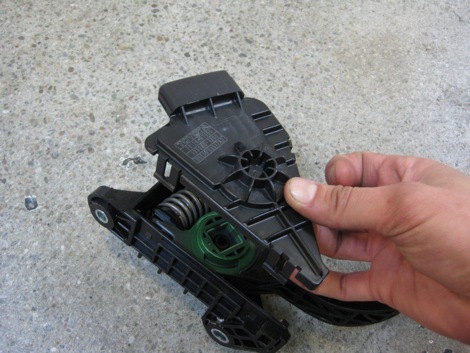 In “drive-by-wire” cars, such as the Prius (and most modern cars), the pedal lever simply moves a magnet (the green colored portion in the photo) which changes the readings of a Hall Effect sensor—in this case two sensors, for redundancy and accuracy, which are conveyed to the HV ECU (the car’s main computer). Pics of the sensor component below. 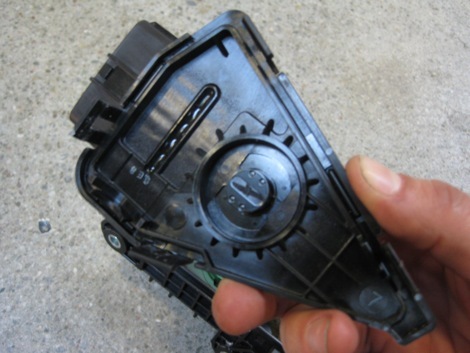 Based on this input the car decides how much to actually move the engine’s throttle plate and, in the hybrid case, provide current to the electric motors. 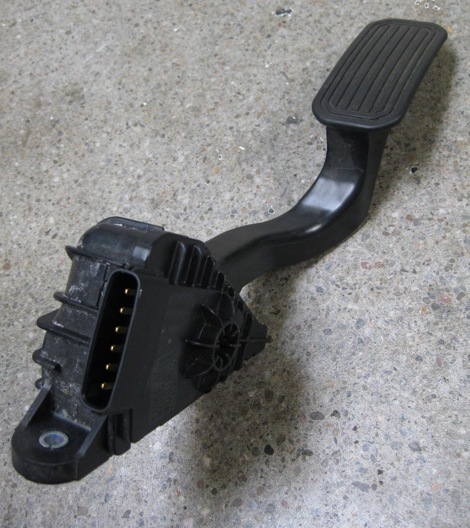 Note that this design makes it impossible for the pedal to stick down, like a hydraulic system does with a leak (dead clutch pedal, dead brake pedal), or bind from a frayed cable (floating throttle, cruise control). This is an important point when considering posts like this one on PriusChat: SCARY; gas pedal stuck, dropped into “b” gear. Basically if the pedal is stuck, something is holding it there. The curious point, at least in my view, is that the accelerator pedal is only a sensor; replacing it with yet another sensor does nothing to change the fact that the car is still effectively “in control.” What’s really in question? First, the software: how well the car can interpret our inputs in a crisis: the accelerator pedal as well as brake, shifter, power button, steering wheel, etc.. What’s our confidence in technology? Second, and more to the heart: what’s our personal ability to carry out those inputs—i.e. do we know how to operate this car? Evidence the videos from our previous blog post, the car will cut power when shifted into neutral or when the brake is applied simultaneously. This is the brilliance of drive-by-wire: the car is smart enough to know it doesn’t need more “gas”, and will override the “gas” pedal request that’s ostensibly from the driver. In my view, this is much safer than a traditional, mechanically operated powertrain.